Now I remember why I would rather drive to Salt Lake City. LAX. Daughter in law Theresa drove us to LAX this morning. All went well until we got to the terminals. Creep and beep, stall and crawl, four lanes of traffic doing about 2 mph. We finally got to terminal 5 for Delta airlines. Got my bag checked. So far so good. Got through security with no problems. I bought an over priced bottle of water for $2.50. Then we headed for the bathrooms. Men’s room was dirty with paper on the floor, one of three urinals stopped up and over flowing. Paula reported that women’s just as bad and worse. Three stalls and line out the door. Paper and sanitary napkins on the floor. What a dump. Terminal 5 is under construction but still that’s no excuse. So next we look for some food. All we want is a muffin and cup of coffee. Went to place called Farmer’s Market. No muffins, no scones, yes coffee, but no ice coffee. $13 for two coffees and brownie and pastry. Other restaurants also way over priced. I would be happy with Mickey D’s or BK, not some upscale eatery with high prices and slow service. 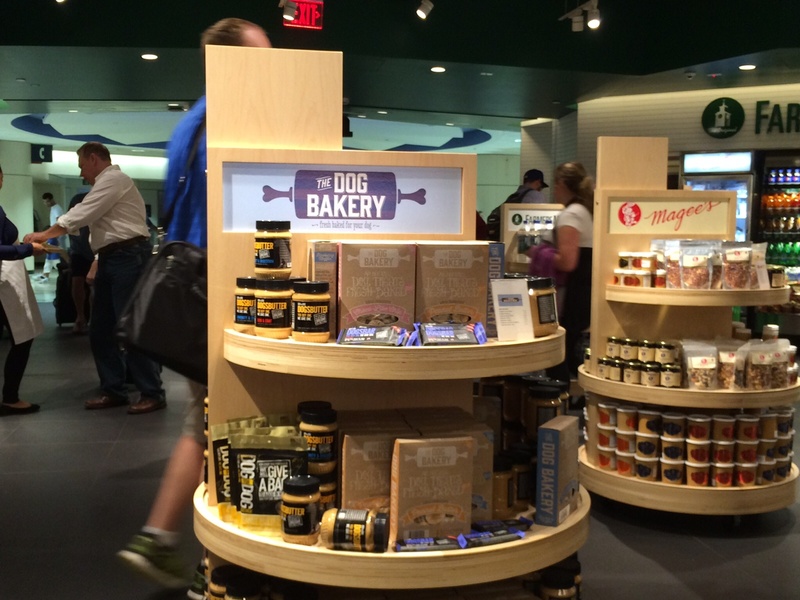 They had a display for doggie treats. Paula wanted to get a treat for Beast. Overpriced and under serviced. Had to wait for an eternity to take her money. Here’s the picture of the doggie stuff. Not worth the wait. Beast ate it but seemed to not care very much. So finally announced boarding. We had booked first class (I’ll explain that in later post.). So we got on board and the stew brought me a gin and tonic right away. Feeling better already. So now we are starting descent into SLC after having been properly medicated. Once on the ground, we need to pick up a rent a wreck ( actually the car is pretty nice, new Ford Edge) and off to West Jordan. This entry was posted on June 23, 2014 at 7:55 pm and is filed under California, Los Angeles, Travel. You can subscribe via RSS 2.0 feed to this post's comments.